We turn to physical cosmology for our most important ideas, the “big-bang” theory, to begin the story of chemistry. The big-bang theory postulates that the universe as we know it, experienced a tremendous explosion of energy and subatomic particles approximately 14 billion years ago and that it has been expanding ever since. Perhaps the first experimental data that suggested that the universe is expanding were observations by Edwin Hubble (1929) and others that the majority of stars and galaxies seem to shine with light that is shifted toward the red end of the spectrum. The well-known Doppler Effect that explains why the whistle of a train has a higher pitch when the train is approaching and a lower pitch as it moves away, was used to explain the red-shift observations. “Hubble’s Law” proposes that the size of the red shift is proportional to the distance and the speed of the star moving away from the earth. Cosmologists concluded that the only way to explain these data was to propose a universe that was expanding in all directions. Working backwards, it was not difficult to imagine that the entire universe a single point that physicists call a singularity. Over time, the observations made by astronomers have all been explained by the theory. Interestingly, one of the supporting experiments was the serendipitous discovery in 1964 by two astronomers, Penzias and Wilson, who were trying to make very accurate measurements with a radio telescope. A persistent static was present no matter where they pointed the telescope. They expended great effort to clean the telescope in an attempt to remove the static. They even scrubbed off the “white dielectric material”, also known as pigeon droppings, from the telescope, to no avail. In the end, they questioned whether the static was more significant than just being some random noise. After careful calculations they concluded that the static was indeed microwave radiation characteristic of a temperature that matched the predicted temperature of the universe after cooling for 14 billion years. Today this is recognized as evidence that strongly supports the big-bang theory. Using the big-bang theory quantum mechanics, and some complex mathematics, physicists and cosmologists are able to provide us with some ideas on how the universe might have developed. The extreme temperature, density, and pressure of the singularity at the start of the universe allowed only the most basic particles such as quarks to exist. Within one second after the big bang, the universe expanded and cooled to about 10 billion degrees, allowing the basic units of matter, quarks, in groups of three, to form protons and neutrons. Within three minutes the temperature dropped to about a billion degrees allowing neucleosynthesis, creation of atomic nuclei, to occur. In neucleosynthesis collisions between protons and neutrons resulted in the formation deuterium, helium and lithium nuclei. When the universe became cool enough that nucleosynthesis could no longer occur, 91% of all atoms were hydrogen atoms, 5% were helium atoms, and all the rest comprised less than 1% of all the atoms as shown in Table 0.1 (below). As the universe cooled further electrons combined with these nuclei to form neutral atoms. If the initial expansion of the universe had an even distribution of atoms, it would have remained as a dark, uniform sea of atoms. Instead there were small disturbances in the dispersion of matter that grew with time. This lead to the first formation of the first stars as the matter coalesced. Practice Exercise 0.2 Suggest conditions that are favorable for nucleosynthesis. Practice Exercise 0.3 Suggest why only the lighter elements were formed during the big bang. As the stars grew in size, the temperature and pressure within each star increased to the point where nuclear fusion of hydrogen nuclei into helium started and stars began to shine. Heat generated from the fusion of hydrogen to helium maintained the volume and pressure within a star for millions of years. During that time the helium, being heavier than hydrogen, concentrated in the core, or center, of the star. In the core the helium interfered with the collisions of the hydrogen nuclei and the rate of these nuclear reactions decreased. The star then cooled and contracted under gravitational forces. As the size decreased, the temperature and pressure rose again and at about 100 million degrees the fusion of helium nuclei into carbon began. After a while the carbon was concentrated in the core and the helium core became a layer surrounding the carbon core. The hydrogen was still mostly found in the outer layer of the star. Continuing, the carbon nuclei entered into nuclear reactions that produced argon. As the amount of argon increased, it migrated inward and became the core, now surrounded by a layer rich in carbon, then a helium layer and finally the outer hydrogen layer. Each successively heavier element concentrated in the core of the star and when there are enough nuclei, nuclear reactions begin to produce and even heavier nucleus which then concentrates in the core and repeats the process. In that way, oxygen and silicon cores are formed, and then forced out into layers by heavier elements. These layers and their nuclear reactions produce large quantities of heat to fuel and expand the star. A rapidly expanding star cannot generate enough heat to keep the hydrogen layer white hot, and as it cools the color becomes red. Stars like this are called red giants. 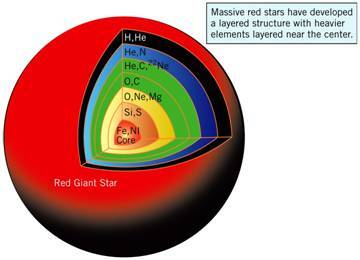 Figure 0.1 illustrates the layered structure of a red giant star. Figure 0.1 Artist’s rendering of the layered structure of a red giant star. Practice Exercise 0.4 Suggest why a core and enriched layers of nuclei are needed for nucleosynthesis in stars. Practice Exercise 0.5 Suggest why, after some 14 billion years, hydrogen still makes up the overwhelming majority of the atoms in the universe. Finally, the atoms started fusing in nuclear reactions to form iron. The iron-forming reaction actually consumes heat and starts to cool the core. This cooling causes a cataclysmic collapse of the star, and as the nuclei rush toward the core the increase in pressure and density do two things. The speeding nuclei destroy many of the iron nuclei, creating a rich mixture of smaller particles such as helium nuclei and neutrons. The temperature of the collapsing star reaches levels that cannot be achieved even in the most massive stars. At its culmination, the collapsing star disintegrates, spewing all its matter into interstellar space. This is called a supernova, in it exists a mix of nuclei that have very high energies and an atom density that has sufficient numbers of collisions to create even the heaviest elements. These conditions for nucleosynthesis last less than a minute, perhaps for just seconds, when the expansion and cooling then make these reactions improbable. The remnants of a supernova are eventually brought together to form a new star to repeat the process. In some instances, the formation of a new star leaves a ring of debris around it. The debris eventually accretes (lumps together) to form planets, moons and asteroids. Practice Exercise 0.6 Why don’t elements heavier than iron form in stars? Practice Exercise 0.7 What conditions do supernovas provide for synthesis of heavier elements? As the stars formed, planets also formed from the debris surrounding the stars. The formation of the planets and the composition of the planets depended upon the matter that was available. Nebula is the word that describes the debris left after the formation of a star forms a disk that can accrete into planets, moons and asteroids. Depending on the debris, the planet can be rocky like the earth, Mars, and Venus or gaseous as Jupiter and Saturn. The final chemical makeup of a planet depends on the materials that accreted at the start and elements that were retained by the gravitational forces of the planet itself. You can find a list of all the known elements inside the front cover of this book. 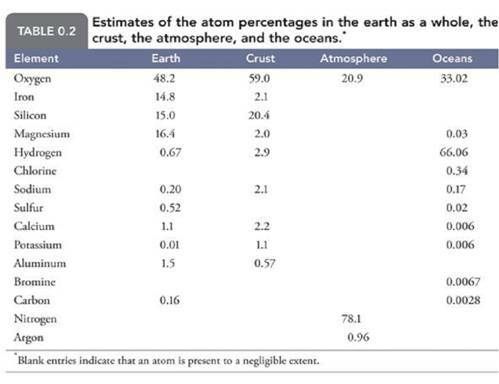 Table 0.2 lists the atom abundance in the whole earth, the crust, the oceans, and the atmosphere. We might expect that the distribution of the elements will be uniform on earth because the nebula that the earth condensed from had a relatively uniform distribution. Taking a quick look around us we see that the earth does not have a uniform distribution of elements either on or below the surface, while the atmosphere and oceans tend to have more uniform compositions. This uneven distribution can often be understood based on the properties of the elements such as their melting points, densities, and solubilities. When the earth formed some 4.5 billion years ago, the solid dust and gas particles in the nebula were slowly attracted to each other by gravitational and electrostatic forces. Once the earth formed, it began heating due to the radioactive elements releasing heat as they decayed to stable isotopes. In addition, bombardment by meteorites also heated the earth’s surface while continued gravitational contraction also added more heat. Eventually a large proportion of the earth melted and iron and nickel migrated to the inner core. Based on measurements of seismic waves (vibrations due to earthquakes) the actual inner core of the earth is composed of solid iron and nickel that is surrounded by a liquid layer of these metals.. The outer core is superheated lava. 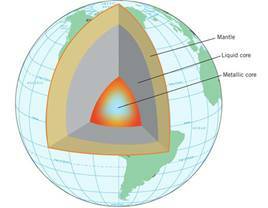 Surrounding the core is the mantle of superheated rock that comprises about 35% of the earth’s mass. The outer layer, comprising the lighter substances that we observe as solid rock and soil, is a ten-mile-thick crust. Figure 0.2 illustrates these features of the inner workings of the earth. Figure 0.2 | Cutaway Model of the interior of the earth illustrating the solid and liquid cores of iron/nickel. The mantle and the thin layer called the crust are shown. The outer core, mantle, and crust of the earth are not very fluid, and so different materials did not have the opportunity to separate on a massive scale as the core did. However you may have seen the exotic patterns of crystals in a granite counter-top. Minerals do separate, but only in small areas. That is also why the surface of the earth is not uniform. Minerals or elements in the crust will separate to a small extent due to similarities in their composition and structure as well as by melting points. For instance, gold atoms tend to aggregate with other gold atoms, rather than silicate minerals (silicon-based rocks) because they have distinctly different crystal structures, densities, and melting points. When the crust cooled the gold separated from the silicate nodes as they solidified. This process is called differential crystallization. Due to the tremendous reservoir of heat in the core, these processes continue to this day and are seen frequently in the form of earthquakes and volcanic eruptions. 0.2 Nucleosynthesis would occur at temperatures around 1 billion degrees and a high density of nucleons. 0.3 Only light elements were synthesized during the big bang because the temperature was too high for the heavier elements to form. 0.4 Core and enriched layers or nuclei are needed for nucleosynthesis in stars because the enriched layers are the lighter layers, which react to form the heavier nuclei. The heavier nuclei are more dense and move to the center of the star. 0.5 Experimental evidence for the concept of nucleosynthesis lies in the layers of the stars and that stars have different compositions and that the most abundant elements are the lightest ones. 0.7 Iron is the heaviest element in stars since the nucleosynthesis of iron absorbs heat and causes the collapse of the red giant and a supernova, thus preventing larger nuclei from forming.